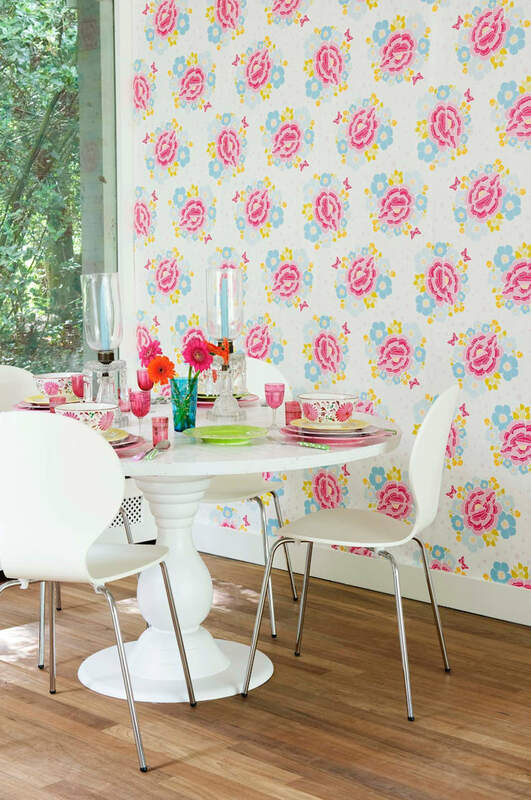 Wallpaper design 'Big Rose' reference 2000102 Roll Size: 10 metres x 53 cms wide. A chic retro inspired design made up of bright playful florals, delicate butterflies and spots on a white background. This paper is washable, with good light resistance and strippable. Room Seven was established in 1995 by Brechtje Olsthoorn, daughter of the founders of Oilily. Together with Coordonne they have designed a beautiful collection of wallpapers featuring the delicate florals, delightful colours and charming motifs of the Room Seven bedding and accessories range. This collection is full of romance and enchantment with butterflies, flowers, checks and dots. This is a truly timeless selection of wallcoverings with designs that are sure to bring a ray of sunshine to your home.